Michael first came to the Bay Area on a cross country road trip with is older sister. He was 19 and lived in Philadelphia. He met up with her in Florida and they spent four months getting to California. Once he saw San Francisco he knew one day he would return. He spent the next several years working at The Frog and Commissary and restaurant catering companies in Philadelphia. He was doing general pastry work and had not yet specialized in chocolate but even back then it was his passion. He would often work and take classes for free, doing whatever was required, at Cacao Barry under Pascal Janvier and Jean-Marie Guichard so he could learn as much as he could. 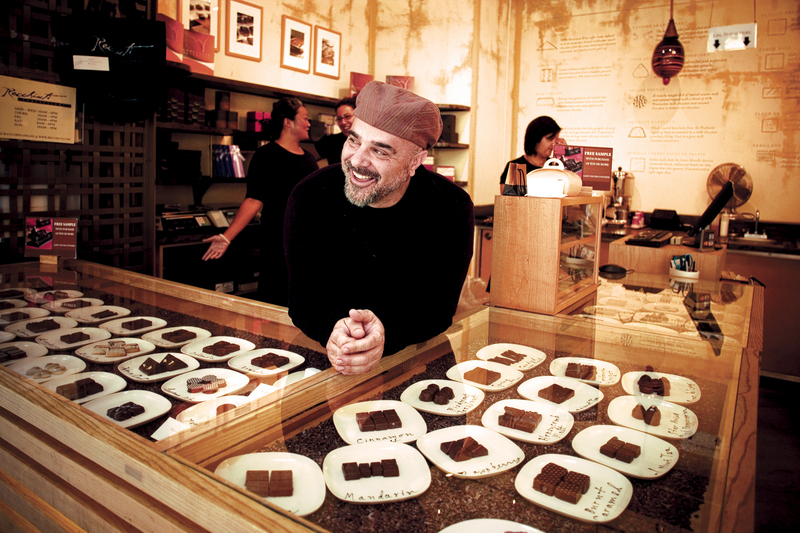 They, along with Alain Tricou of Maxim’s and Déjà Vu Restaurant, taught him the fundamental techniques he needed to start his life long quest to make great chocolates. In 1986 he made the move to California and worked at Taste Catering and for other catering companies in the Bay Area. In 1991 he was pulled back to the east coast where he taught at The New England Culinary Academy (NECI) and then was pastry chef at a couple of resorts in New England. It was at Twin Farms Resort and Spa in Barnard, VT that he and Jacky, his wife, were finally able to lay the ground work for his chocolate company. They developed their first line of chocolates and in 1997 returned to San Francisco to start Recchiuti Chocolates. I sat down with Michael in his factory office on Third Street for some Q & A. Michael spends most of his time making chocolates in the factory part and not lounging in his office but the drum set that takes up a good part of it I know makes him wish he could spend more time there. EL: What kinds of chocolate do you use? MR: Guittard, Valrhona, and El Rey. We have developed a custom blend with Valrhona that allow us to achieve my desired flavor profile. What flavors/ingredients do you like best? I really like our grapefruit and tarragon. People at first may think this is a bit odd but once they try it they love it. What I love about this combination is how it developed into a chocolate. I first made it as a granita intermezzo, then in a ganache and finally into a formed chocolate. The candy like flavor of the tarragon and the bitterness of the grapefruit pair beautifully together. Probably cinnamon, lavender, and pepper. Mostly because they are used with too heavy a hand. Dark-Tarragon and grapefruit or vanilla. Interestingly many chocolatiers are stopping using vanilla as they use more fruity chocolates. I love vanilla and feel it is hard to overdo. We use whole pods that are ground up, not just the insides. The pod adds a complexity to the flavor. What chocolate dessert has someone created that you absolutely loved? Annie Walker’s Chocolate Pot de Crème from 42 Degrees. It was perfect. Simple and complex. She would get annoyed it was the only dessert I would ever order but it was so good. Doesn’t need whipped cream or any garnish. What flavor do you think is underappreciated in pairing with chocolate? Pink Peppercorn with Star Anise. I often have to talk people into trying it but then they are hooked. What’s your least favorite trend in chocolates? The crazy flavors chefs add- meat, vinegar, mushrooms, caramelized onions. An immersion blender or a fine mesh sieve. Piccino, Brunch at Zuni, Serpentine, Statebird Provisions. What was the last thing you made at home? Chocolate Chicken breasts with a ground up cocoa nib and butter paste. I blackened them on an inverted cast iron skillet (a trick I learned from Jan Birnbaum), finished them in the oven and served it with homemade fettuccine. What do people not know about you that they may be surprised to find out? I love playing the drums. In Philly I did experimental music. If you want to hear me play the drums, this Sunday I will be in a marching band in Dogpatch. The clothing company Lemon Twist is operating a pop up store until April in our future café space. The Lemon Twist Marching Band will perform between 1 and 4. We’ll march west on 22nd Street between Third and Mississippi.